Cecil, bargello certainly enjoyed immense popularity in the 1970s, but it is also becoming more popular again now. Many needlework techniques tend to have such periods of being the "in thing" before dwindling off and then coming back 20-30 years later. If stitched with carefully chosen colors there is no need for this style of needlepoint to look dated, however. It is one of the easiest forms of needlepoint, using just straight stitches. Once you get into the swing of it, you will find you don't need to keep looking at the paper pattern, which makes it ideal to sit and stitch in front of the TV, or to take with you when you are traveling. Although we only use one stitch, it can be arranged in different ways to form many different patterns, some of which are reminiscent of flames, which is why it is also known as flame stitch embroidery. Other pattern names include wave, ribbon, trellis, arrowhead, scallops, gothic spire and flowers, which are all suitable for when you are starting bargello. 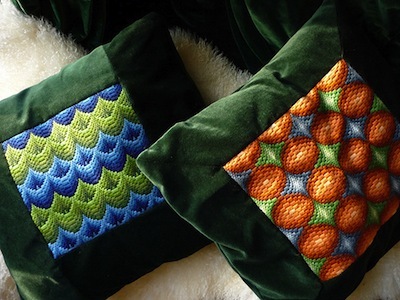 Some patterns form undulating rows, while others form what is known as medallions, as in the gorgeous orange and green pillow above, stitched by Jody Morris who was kind enough to give me permission to share her photograph (you can see more of her work on Flickr). As a beginner I would suggest you start with the rows as it is easier to see where you are going. Four way bargello is perhaps the most beautiful way of utilizing the patterns. The pattern is divided into four sections on the diagonal. The stitches are worked to fill each segment in turn and turn 90 degrees along a mitre line at each corner. However, this is an advanced form, and needs very careful counting to achieve a successful result. Join in and write your own page! It's easy to do. How? Simply click here to return to Needlepoint forum.